CANMORE, Alta. 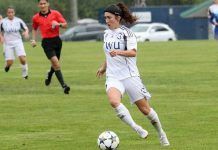 – The people tasked with capturing and celebrating university sport in Western Canada were acknowledged Thursday in Canmore, Alta., as the inaugural Canada West Sports Information & Digital Awards were handed out. The awards were created this season to publicly honour individuals, who tirelessly work to showcase university sport through coverage of outstanding coaches, student-athletes, and staff. Four awards were handed out as part of the conference’s annual meeting of sports information directors. 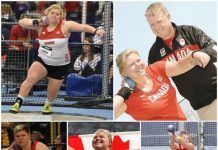 The Calgary Dinos earned a pair of awards (Top Feature Story and Photo of the Year), while the Saskatchewan Huskies earned Video of the Year, and Fraser Valley claimed the Top Social Campaign. 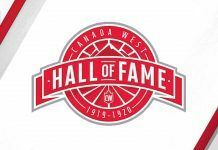 The awards were voted on by Canada West’s 17 sports information directors. “Every season our member’s sports information and digital staff work tirelessly to capture the very best of university sport across Western Canada. These individuals work hard throughout the year, and are often the first to come and last to go on game days. We’re excited to be shining the spotlight on the important work they do,” said CW Associate Director of Communications and Marketing, Evan Daum. This year’s Top Feature Story comes from the University of Calgary, where Hec Crighton winning quarterback Adam Sinagra’s historic night was profiled by Ben Matchett and Lance Doucet in their story Sinagra’s brilliance echoes 1983 Vavra classic. Sinagra threw for 569 yards on October 14th against the Saskatchewan Huskies – just 58 behind former Dino Greg Vavra’s U SPORTS and Canada West record of 627. Calgary capitalized on Sinagra’s amazing night with their feature story, recounting the excellence of Vavra’s night back in 1983, including insights from Dinos’ longtime sports information director Jack Neumann, who saw both outstanding performances in-person. This photo was snapped just moments before the 82nd Hardy Cup at McMahon Stadium, as the Calgary Dinos ran out to face the Saskatchewan Huskies. 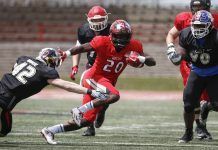 Photographer David Moll has been capturing Dinos Athletics for years, chronicling countless Canada West games, while also shooting plenty of other events around the Stampede City. Moll has proven to have a unique ability to be in the right place at the right time, making him one of the nation’s top photographers when it comes to capturing university sport. It was an historic season for the Saskatchewan Huskies, who rose to the top of Canada West football for the first time since 2006. 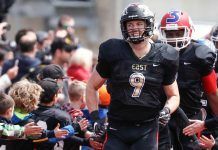 Tabbed sixth in the annual pre-season coaches poll, Saskatchewan defied the odds all season, including in the 82nd Hardy Cup against the Calgary Dinos. David Conlin was tasked with documenting Saskatchewan’s return to conference prominence, as the digital coordinator captured the Huskies’ dominant 43-18 victory at McMahon Stadium. If you’ve noticed Fraser Valley’s online presence this season, you’re not alone. Communications coordinator Dan Kinvig made the Cascades look good this season, with a new website, and plenty of quality social media content. 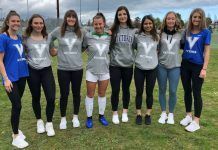 His best work was arguably the school’s Senior Night graphics, as Kinvig went the extra mile to honour UFV’s graduating athletes on the occasion of their final regular season home game. The graphics were posted across UFV’s social media channels, and were also presented as framed gifts for each athlete, making them multipurpose masterpieces. Kinvig’s attention to detail, and quality design didn’t go unnoticed, earning kudos from the people that mattered most – the student-athletes themselves.